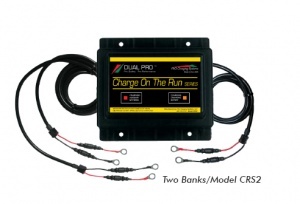 A Drop In Replacement & Upgrade from AGM, Gel or Lead Acid Batteries. 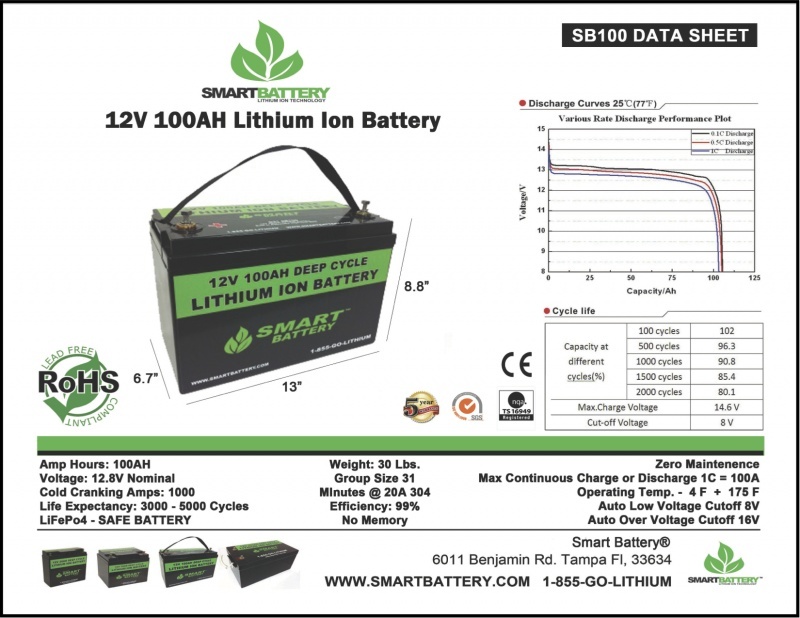 The Smart Battery 12V 100AH Lithium Ion Battery is the Ultimate High Performance solution for virtually any application. Backed by a Limited Lifetime Warranty, the SB100 will exceed your expectations and can provide over 10 years of worry free operation. 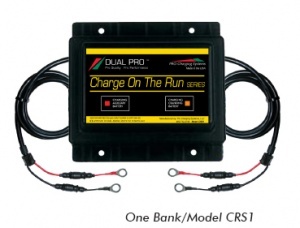 This battery features an automatic built in battery protection system (BPS) that keeps the battery running at peak performance and protects the cells for thousands of cycles. 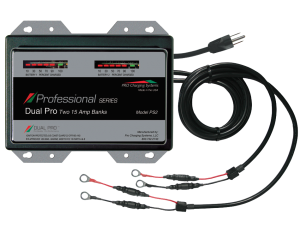 The SB100 is plug and play for any application that currently uses a lead acid, gel or agm battery. 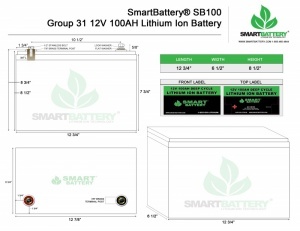 The Smart Battery SB100 12V 100AH Lithium Ion Battery is the perfect replacement from a group 31 AGM, GEL or Lead Acid Battery. The SB100 is designed as a "drop in replacement" meaning all you have to do is take out your old group 31 battery and place the SB100 in the same way. 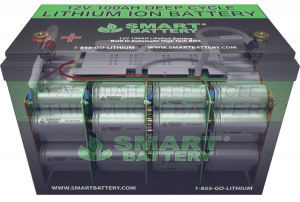 Smart Battery Lithium Ion Batteries are Green, Non Hazardous and have about 30% more energy density in the same size case as a lead battery. Because your lead batteries can only be drained to 80% and are only recommended to drain down to 50% - In some cases the Smart Battery can produce over 50% more usable energy than the same size lead battery. 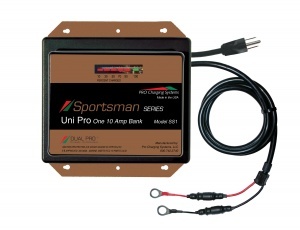 As you may know, Your existing lead based batteries are inefficient, obsolete and a problem waiting to happen. 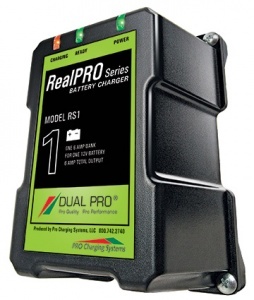 Typical Lead Acid Batteries have many problems including: they loose up to 30% of their energy per month from self discharging. 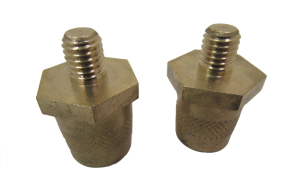 They have a severe voltage drop when a load is placed on them, they can off-gas, leak acid and hazardous chemicals, do not last long, they are very heavy and made of a toxic material. 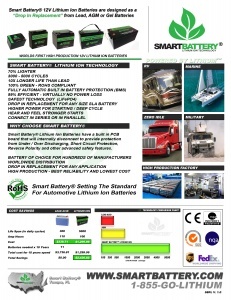 Smart Battery Lithium Ion Batteries are 99.9% efficient, Provide over 100% usable energy of the rated capacity, and lose less than 1% per month self discharge. 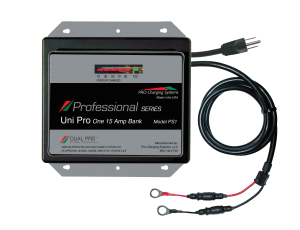 Whether you are installing a new Solar System, replacing your Marine Boat Batteries or outfitting a commercial application, Smart Battery Lithium ion Batteries give you the chance to do energy storage right from day one. 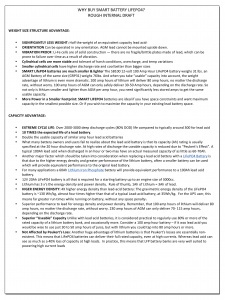 Most Important for you are the facts that Smart Batteries can last over 5000 cycles meaning you buy a Smart battery once and you are done. 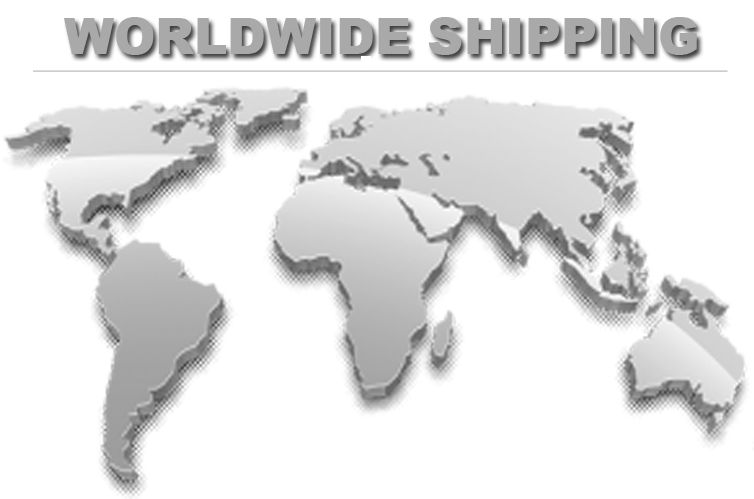 And considering their longevity and the efficiently they are less costly than the heavy and toxic lead acid batteries. 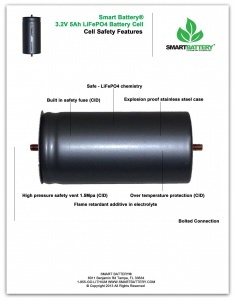 If you want to "go green" the lithium ion Smart Batteries are not only virtually indestructible but they are non-toxic. 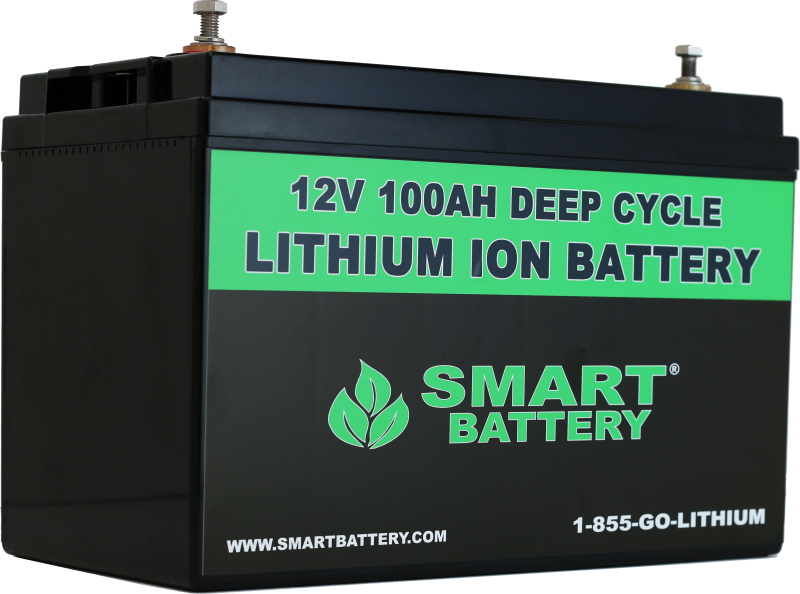 The Smart Battery is readily available direct through Smart Battery or by contacting one of our local distributors closest to you. This fantastic technology is making our planet a better and cleaner environment.